Near fatal asthma (NFA) is a serious medical condition that often results in profound hypoxemia, hypercapnia, and altered mental status. Patient with NFA breathe at high lung volumes leading to increased mechanical load and elastic work of breathing. Mechanical ventilation is often required to manage asthmatic patients who deteriorate despite aggressive management; however, it can have deleterious effects due to worsening dynamic hyperinflation and increase intrathoracic pressure. The reported mortality rate in patients who require ventilator assistance is 8%. ECMO is an alternative method of cardio-pulmonary support in which oxygen is added and carbon dioxide (CO 2 ) is removed through an extracorporeal membrane using arteriovenous or veno-venous cannulation. The goal of this therapy is to minimize ventilator-induced lung injury and allow ample time for the lung inflammatory process to subside. Its use in severe asthma is limited to case reports or a case series. , In this case, we report a patient with NFA who had hypoxemia that was refractory to conventional therapeutic modalities and was managed by ECMO. A 15-year-old boy known to have asthma presented to the emergency room with one day history of cough and shortness of breath (SOB). On clinical examination, he was diaphoretic, tachypneic, and using his accessory muscles, blood pressure (BP) 120/70 mmHg, pulse 110/min, RR 42/min, temperature 37°C, and oxygen saturation was 92% on FiO2 of 6L/min. His initial arterial blood gas analysis (ABGs) was pH 7.35, PCO2 37 mmHg, PO2 64 mmHg, HCO3 25 mEq/L. Chest examination revealed decreased breath sounds and bilateral wheeze. Chest X-ray was normal. Complete blood count (CBC) and other blood tests were normal. He was started on IV fluids; nebulizations with Salbutamol, Ipratropium Bromide, Budenoside, and Oxygen; intravenous (IV) Magnesium Sulphate, antibiotics, and high-dose IV steroids. He was also placed on Bi-Level Positive Airway Pressure to reduce the work of breathing (IPAP14 and EPAP 8, FiO 2 of 70%). However, clinically unchanged, with repeat ABGs pH 7.20, pCO 2 44 mmHg, pO 2 70 mmHg, HCO 3 18 mEq/L, and his serum lactate level was 3.1 mmol/L. Therefore, he was intubated and transferred to the intensive care unit (ICU). The patient was started on assist control mode, with respiratory rate of 18, tidal volume 5ml/kg, FiO 2 100%, I:E ratio of 1:4, and positive end-expiratory pressure (PEEP) 5cmH 2 O. He was sedated with propofol, midazolam, fentanyl, IV muscle relaxant (cis-atracurium), norepinephrine 10 mcg/min, and salbutamol infusion at 5μg/min. Despite ventilator manipulations to decrease minute ventilation and allow permissive hypercapnia, his peak and plateau airway pressure were persistently high at 57 and 40 cmH 2 O, respectively. Sodium bicarbonate infusion was started due to severe concomitant metabolic acidosis. 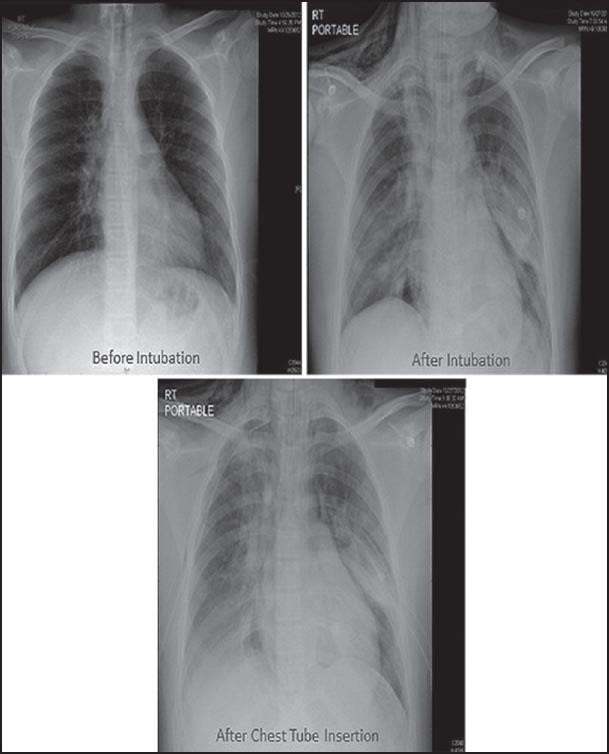 About 8 hours later, he developed surgical emphysema and bilateral chest tubes were placed prophylactically [Figure 1]. Bronchoscopy and bronchoalveolar lavage were performed to remove any mucus plugs; however, none were seen. Despite being on these measures, his respiratory status continued to deteriorate, so the decision was made to start him on ECMO, using the left femoral veno-venous route with heparin infusion and monitoring of activated clotting time (150-200 s). His ABGs improved over the next 2 hours [Table 1]. Ventilator settings were weaned to assist control mode, tidal volume 6 ml/kg, rate 14/min, FiO 2 40%, and PEEP 5 cmH 2 O. ECMO was continued for 72 hours; meanwhile, the patient was kept sedated and ventilated; continued on antibiotics, nebulization, steroids, and IV salbutamol, along with heparin infusion, norepinephrine, and cis-atracurium. After 3 days, ECMO was discontinued with no consequences. On the fifth day, he was extubated and transferred to the ward and was discharged home on the sixteenth day after admission to be followed up in the pulmonary clinic. The severe derangement in gas exchange of this patient was managed beyond the current clinical practice guidelines. He had persistent extreme respiratory embarrassment and ventilatory failure despite being on maximum conventional therapy including mechanical ventilation. He also sustained both barotrauma and hemodynamic instability requiring vasopressors. The mechanism of hypoxemia and hypercapnia in acute asthmatic attack is mainly due to low ventilation perfusion, mismatch, shunting, and hypoventilation. , The application of ECMO in this case has provided a bypass where extra-corporeal blood flow through a membrane has achieved adequate oxygenation and CO2 removal. This was necessary to rest the lung, until the inflammation causing his bronchospasm has subsided. In a retrospective cohort study, using life support organization (ELSO), Mikkelsen et al., found that among 1,257 patients treated with ECMO, 24 (1.9%) were asthmatics of whom 20 (83.3%) survived to hospital discharge, compared to 1,233 (50.8%) non-asthmatics. The success of ECMO in asthma was likely due to the natural reversibility of the airflow obstruction in asthma. This is in contrast to the patient with diffuse alveolar damage due to ALI, where the recovery is usually slow. Moreover, by virtue of its mechanism of action, applying ECMO allows reduction of both the tidal volume and minute ventilation, which subsequently decrease the dynamichyperinflation. These further reduce the development of barotraumas and hemodynamic instability particularly with persistent hypoxemia and acidemia, and who appear to have extremely severe disease. Successful management of patient with NFA in ICU requires high level of expertise and intensive support. Aggressive therapy, including careful manipulation of mechanical ventilation, and possible use of ECMO in the proper setting can be life-saving. Restrepo RD, Peters J. Near-fatal asthma: Recognition and management. Curr Opin Pulm Med 2008;14:13-23. Papiris S, Kotanidou A, Malagari K, Roussos C. Clinical review: Severe asthma. Crit Care 2002;6:30-44. Krishnan V, Diette GB, Rand CS, Bilderback AL, Merriman B, Hansel NN, et al. Mortality in patients hospitalized for asthma exacerbations in the United States. Am J Respire Crit Care Med 2006;174:633-8. Brogan TV, Thiagarajan RR, Rycus PT, Bartlett RH, Bratton SL. Extracorporeal membrane oxygenation in adults with severe respiratory failure: A multi-center database. Intensive Care Med 2009;35:2105-14. Chang CL, Yates DH. Use of early extra-corporeal membrane oxygenation (ECMO) for severe refractory status asthmaticus. J Med Cases 2011;2:124-6. Mikkelsen ME, Pugh ME, Hansen-Flaschen JH, Woo YJ, Sager JS. Emergency extracorporeal life support for asphyxic status asthmaticus. Respir Care 2007;52:1525-9. Friedlander AL. Fatal and near fatal asthma: Phenotypes, precipitating factors, and management. Respir Rep 2007;3:22-33. Hirshberg E, Miller RR 3rd, Morris AH. Extracorporeal membrane oxygenation in adults with acute respiratory distress syndrome. Curr Opin Crit Care 2013;19:38-43. Davies A, Jones D, Bailey M, Beca J, Bellomo R, Blackwell N, et al. Australia and New Zealand Extracorporeal Membrane Oxygenation (ANZ ECMO) Influenza Investigators. Extracorporeal membrane oxygenation for 2009 influenza a (H1N1) acute respiratory distress syndrome. JAMA 2009;302:1888-95. Mikkelsen ME, Woo YJ, Sager JS, Fuchs BD, Christie JD. Outcomes using extracorporeal life support or adult respiratory failure due to status asthmaticus. ASAIO J 2009;55:47-52.